The Magnesphere – It’s not just for humans anymore! 26 Jul The Magnesphere – It’s not just for humans anymore! 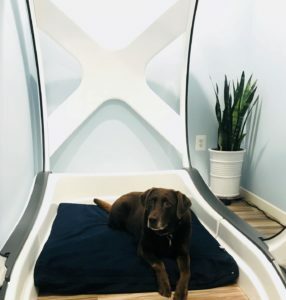 Synergy Float Center, located in North Old Town Alexandria, has an amazing machine called the Magnesphere that provides Magnetic Resonance Therapy to people and animals with amazing results. Synergy Float Center, owned and operated, by an long time old town resident and disabled veteran has been opened since November 2017. The owner, Chris Jones, retired out of the military in March of 2016, and discovered flotation therapy, magnetic resonance therapy, infrared sauna therapy, light therapy, acoustic vibrational therapy and they changed his life so significantly, that he decided to open his one of a kind innovation wellness center and bring these amazing therapies to the community. To date, over 2400 clients have utilized his services and the Washingtonian Magazine ranked his center the #73 of 168 best of Washington, in the June 2018 issue. Those clients that visited the center to date, have been of the humanoid type, until now. 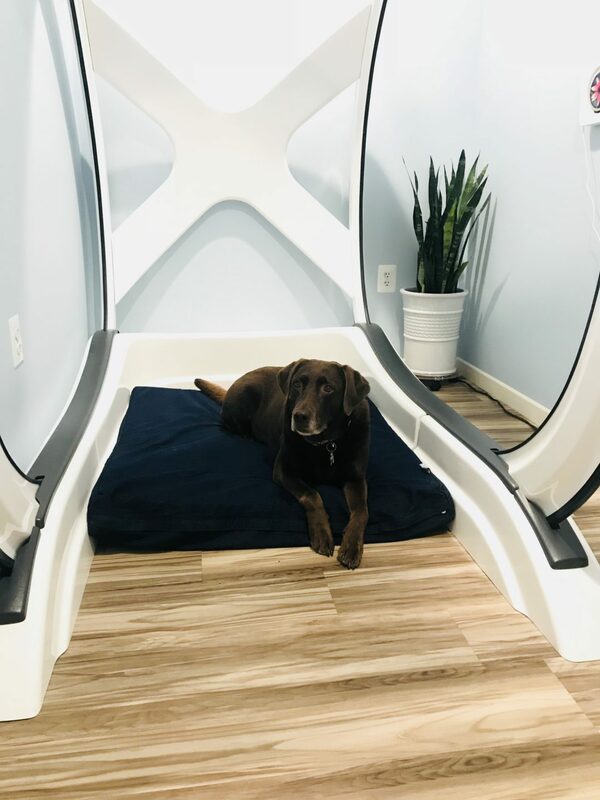 Beginning in July 2018, Synergy Float Center is expanding its magnetic resonance therapy services to our four-legged friends. Ironically, canine and human nervous systems are similar. Want to improve your dog’s quality of life, without expensive surgeries, or medicines, and in a noninvasive manner? Try the Magnesphere today! It has over 36 animal specific protocols. These include: Addisons, Aggressive behavior, Allergies, Anxiety, Cancer (patient in Chemo), Cancer (desiccation or anti-angiogenesis), Cruciate Injury, Cushings, Cystitis, Degenerative Disk disease, Degenerative Myelopathy, Depressed Behavior, Diarrhea, Digestive System (Reflux/GERD), Hyperthyroidism, Hypothyroidism, Inflammation, Kidney Failure, Osteoarthritis (mild-moderate), Osteoarthritis (moderate-severe), Osteoarthritis (severe), Paralysis (Cranial Nerve), Paralysis (Peripheral Nerve), Parasites, Pneumonia, Post Surgery (Bone Trauma), Post Surgery (Soft Tissue), Post Surgery (Tendon/Ligament), Prostatitis, Pylonephritis, Relaxation, Seizures, Sprain, Fracture, Vomiting (diminish GI action), Vomiting (enhance GI action), and wounds or burns. The best part is, both you and your four-legged friend can experience the noninvasive therapy together. Depending on the size, the dog just sits on the lap of its owner, inside the Magnesphere’s energy coilings. If Fluffy, is too big, they will lay in a dog bed and the owner will sit next to them in a chair. The manufacture recommends 3-21 sessions, depending on the severity of the problems, within a two to four-week period. Think the magnesphere does wonders for dogs? Wait until you see what it, and the other therapies at Synergy Float Center can do for you. So, whether you have two legs or four, synergize your mind, body, and soul at Synergy Float Center today.